Federal Minister for Social Services Kevin Andrews has visited a Sukkah in Melbourne. “To all my friends in the Jewish community here today, I say ‘Shalom’ and ‘Hag Sameach’! 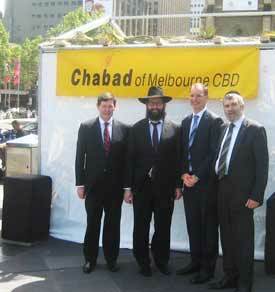 I’d like to acknowledge all the work Chabad has done here in Melbourne since 1997. The Lubavitcher movement is clearly one of the most dynamic elements of our vibrant Jewish community. It’s also great pleasure to celebrate ‘Sukkot in the City’ with you. The Feast of Tabernacles constitutes the beginning of the end of the Days of Awe, the most important period in the Jewish calendar. Each year at the Passover Seder table, Jews are enjoined to think of the Exodus from Egypt as though they themselves personally experienced it. And Sukkot plays an important role in that remembrance process by recreating the ramshackle dwellings inhabited by the People of Israel during their 40-year sojourn in the Sinai Desert. This holiday also signifies an indispensable step in the Jewish People’s progress of liberation from slavery under Pharaoh – through the receipt of the Torah at Mt Sinai – and the ultimate return to their ancestral home in the Land of Israel. In our lifetime we’ve witnessed a similar miracle in the reestablishment of a democratic, pluralistic Jewish State of Israel. Seek the peace of Jerusalem and may those who love you enjoy serenity; May there be peace within your walls and tranquillity within your palaces; For the sake of my brethren and companions I shall speak of the peace within you.